Zayn Malik’s incredible rise to the top of the solo charts was only reaffirmed last week as he was named as the New Artist of the Year at the annual American Music Awards. After leaving the massively successful boyband, One Direction, in March 2015, the Bradford born singer has taken the music world by storm. His debut album, Mind of Mine, and debut single, Pillow Talk, both rocketed to number one in the US and UK charts, making him the first ever British male to achieve such a feat. 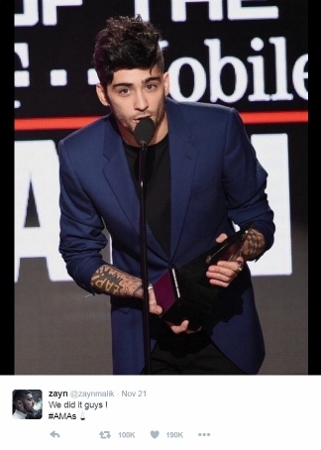 Accepting his award on 21st November, Zayn thanked all those who had helped him in his musical career. “This just says my name on it, right?” he joked in reference to his former boyband days, adding: “It's been a crazy year. “I can't thank the people who have been with me every day for the past year enough. To this very point, being stood on this stage is crazy. “My family, my mum, my dad, everybody in my family who's been supporting me this last year, especially my dad actually, so thank you dad. Zayn was voted to be the recipient of the award by his fans, beating fellow nominees: Alessia Cara, The Chainsmokers, DNCE and Shawn Mendes, to the title. After receiving his trophy, the 23-year-old embraced his girlfriend, Gigi Hadid, who was hosting the night’s awards alongside Jay Pharoah. An expected reunion with former One Direction bandmate Niall Horan on the night, turned out to be just a quick handshake between the two British stars.